Football has always been known as a beloved (or impossible to evade) sport and it’s without a shadow of a doubt the most popular sport on earth. As a fan myself – I’ve seen it evolve into more of a global entertainment business over the years and I’ve witnessed even the most die-hard fans wash their hands with it. But for many believers the church of footballism is a glorified cult and their clan mentality breeds pure hatred and contempt for those who dare to declare their devotion to a rival tribe. The striking similarities between deeply religious people and intense football fans are impossible to ignore and can only be rejected by the uninformed, or those clouded by denial. There are an abundance of well-known football rivalries around the world, but it really doesn’t get much more unapologetically fervent than what is known as the; “Superclasico” local derby in Argentina, where illustrious foes Boca Juniors and River Plate go head-to-head for the bragging rights of being the greatest team in Buenos Aires. 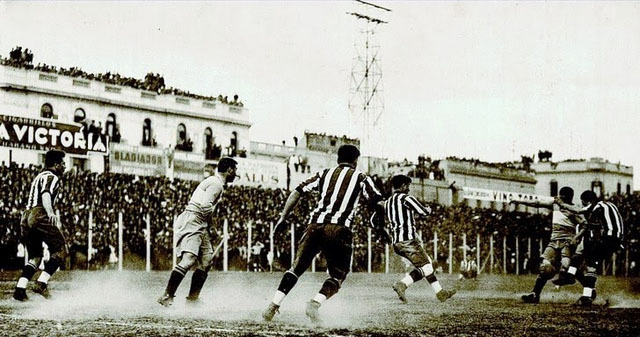 The word; “clásico” basically means derby (an intense local rivalry) and “super” just speaks for itself – the 2 most successful teams in Argentina facing one another adds to the magnitude of what’s at stake…throw in a bit of good old class-warfare and what you get is football’s very own version of civil war. 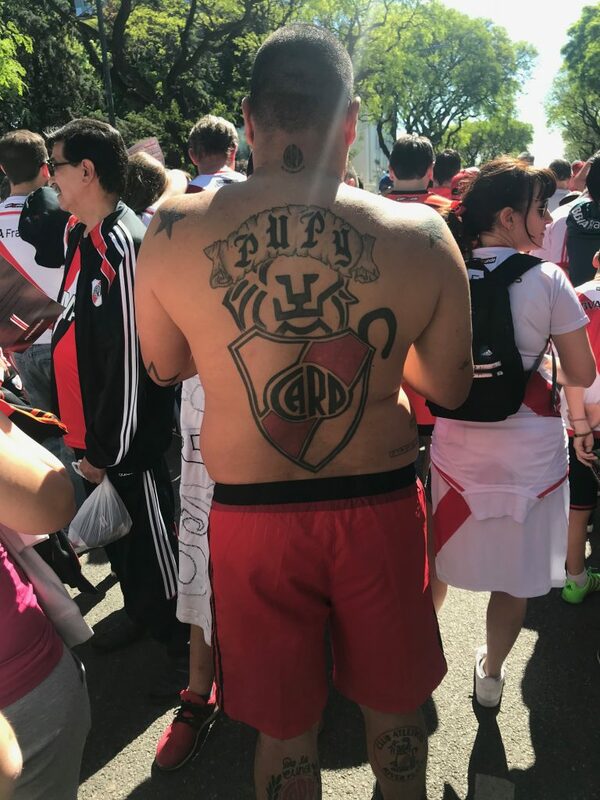 River Plate fans reside in the north of Argentina’s capital, the richer part of the city. They are seen as the middle/high-class (posh) fans and even refer to themselves; “The Millionaires.” Their club legends list boasts Argentinian football players past and present such as Alfredo Di Stefano, Gonzalo Higuaín and (my personal shout for the best player of Brazil World Cup 2014) Javier Mascherano. Boca Juniors fans are from the “Boca” district of Buenos Aires, and refer to themselves as “la doce,” (as they are the 12th man). They historically represent the poor/working-class and immigrants of BA. Their hall of fame football club icons swaggers the undeniably impressive likes of Gabriel Batistuta, Carlos Tevez and it goes without saying that their most celebrated son is some mouthy little fucker who goes by the name of Diego Maradona. I was well on my way to Patagonia from Rosario, but when I saw that these guys were playing each other I felt like it was written in the football-shaped, seething-Argentinian bloke stars. I take my bucket list (soon to be published here) very seriously and most of my success on getting those delicious little ticks is down to doggish perseverance and being in the right place at the right time. The Superclásico opportunity fell upon me – and I had to make it happen. 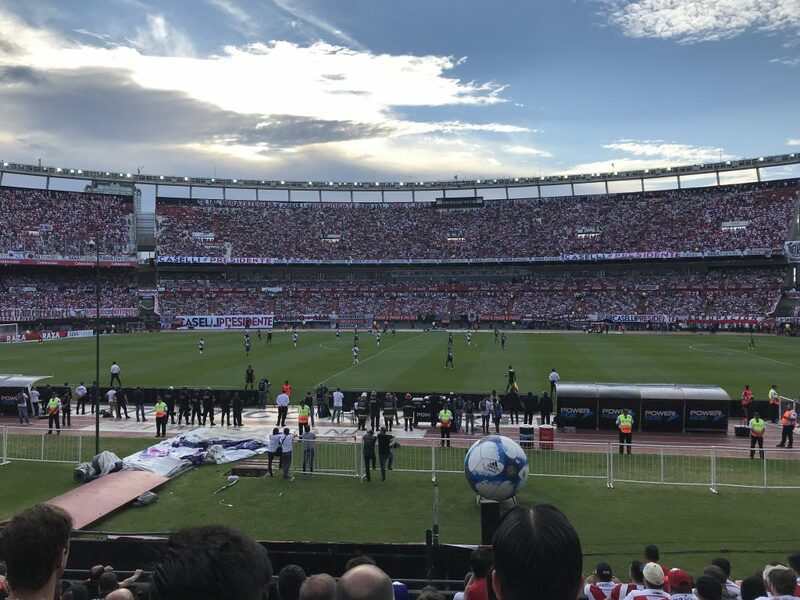 I networked my tiny little arse off, trying to get this cheaper by free-styling it, but you have to be a long-term special member of a club for Boca or River in order to buy a ticket – and in this case you would be trying to get a ticket for the biggest match of the season. That’s tantamount to trying to prize tickets out of the hands of an army of menopausal Cliff Richard fans. 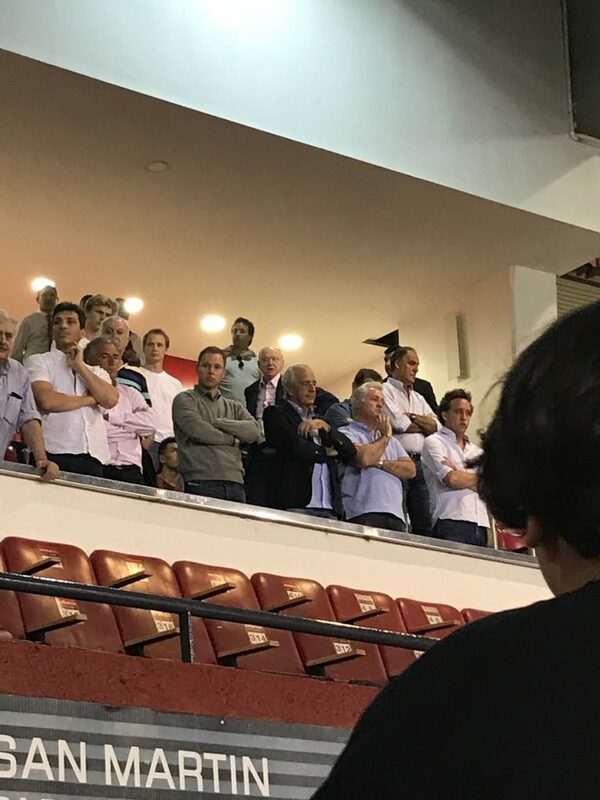 I would have been more than happy to even purchase a “nosebleed seat,” high up in the upper stands of the stadium, so I replied to my contact at one of Argentina’s most reputable tour company, “Tangol“ who offered me seats to a Boca game a week earlier. This time they were giving me the extreme hard sell of the only remaining tickets for the Superclásico; 12,000 Argentina Pesos (just shy of 700 US Dollars at the time of publication). The seats were advertised as being in the VIP section, right in front of the club’s owner! This was a bucket list opportunity of epic proportions. I ordered myself a strong espresso and decided to go ahead with it before I even got to the bottom of the cup. I booked a flight back to BA, bought the tickets on the link provided by my Tangol rep, then I sent my hotel details to them and waited for further instructions. 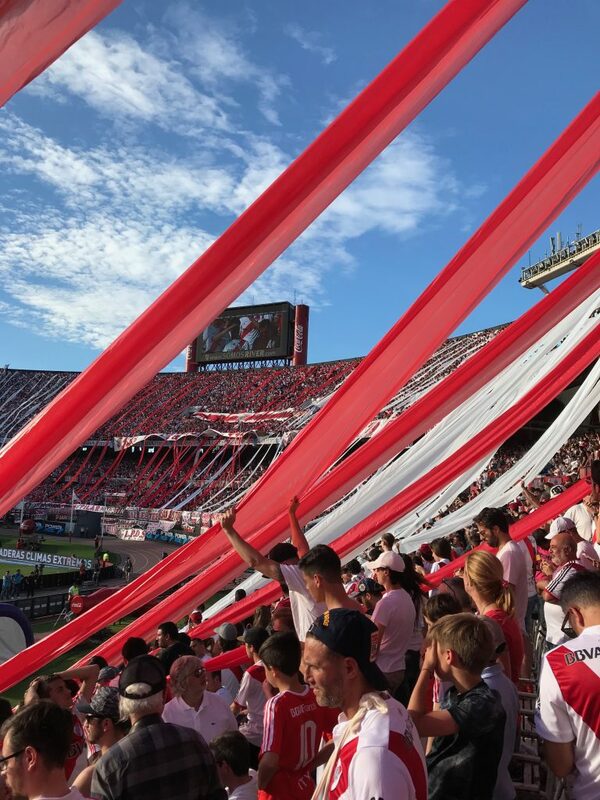 On match day the Tangol guide picked me and some typically excitable Italian men up at our hotel and we made our way over to River Plate’s stadium, Estadio Monumental Antonio Vespucio Liberti. Once we got close to the ground, the atmosphere was a mixture of boyish excitement and jittery anxiousness. The security is extremely tight, I was thoroughly searched maybe 8 times before actually getting into the stadium. The police at the match are in no mood for small talk, or friendly banter and one officer even offered a River fan out for a fight when he dared to ask him a question about the speed of the queue. Once I got into the stadium, I couldn’t believe my eyes at what I thought was an incredibly huge stadium. It felt almost double the size of St James’ Park (Newcastle United) but it turned out to only have 9, 000 more seats – it was the powerful energy inside stadium that screwed with my perception. I dare say I grabbed one of the best seats in the house, with a perfect, slap-bang in the middle of the pitch view. I went for a nervous wee and got to my seat 10 minutes before the kick off. Something seemed missing and I tried to put my finger on what it was, and then it hit me – where the hell are the Boca fans?! I asked one of the few men around me who weren’t screaming like hysterical, hungry hyenas and he told me that the Argentine football is so cursed by violence that there is currently a national ban on ALL away fans attending football matches. The straw that broke the camels back being the death of a fan during a match in 2013. I was honestly a little deflated when he told me that. I find fighting over football so incredibly pathetic, but what about the banter, or lack thereof? Surely this will hinder my Superclásico experience? My concern was quashed almost as fast as I had created it, due to the pre-match celebrations leaving me in a state of sensory overload. Fireworks roared, fans sang their war-cry songs in unison and giant sized red and white paper mache ribbons fell from the top of the massive stadium as the players got ready to battle. The match was very eventful, resulting In 2 filthy red cards, 3 gorgeous goals and Boca going home with all three points in a fiery 2-1 victory. 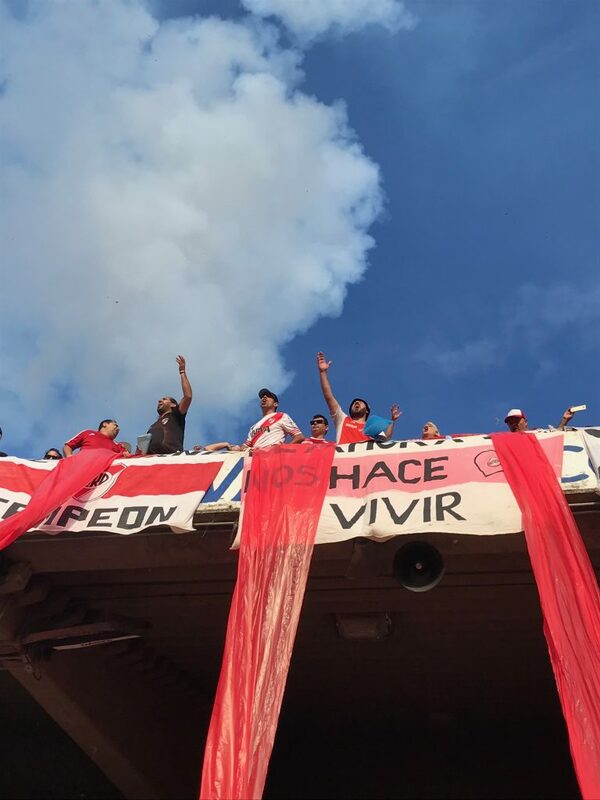 If you’re a football fan and you have always wanted to go to the Superclásico, you will not be disappointed by the constant electric atmosphere in the ground for this fixture. I’ve been to a few Tyne/Wear derbies (Newcastle United vs Sunderland) and to be honest the Superclásico experience makes that one seem like listening to Pan Pipes in the bath with some scented candles. It was an absolute cauldron and I’ve never known a football experience like it – and I’ve been to some of the sauciest derbies possible around the world. If football isn’t really your thing and you have a disdain for the uglier side of football, then I’d say that this is not for you. The fans are insane and basically act like apes in human skin. Not only are away fans banned – but alcohol is also 100% prohibited. England has its football violence problems too, but we are at least allowed to drink in the club bar – we are just not permitted to drink on the terraces during a match. But in Argentina the fanaticism is seemingly on another level, as the final whistle blew the fans turned around and turned on their club’s owner sitting behind me! This resulted in an interesting schism, as other fans defended their owner and almost started a brawl amongst their own fans…and this is in the supposed “classy” part of the stadium. I can only begin to imagine how it gets when you add in a couple of thousand of their arch rivals and beer into the mix! 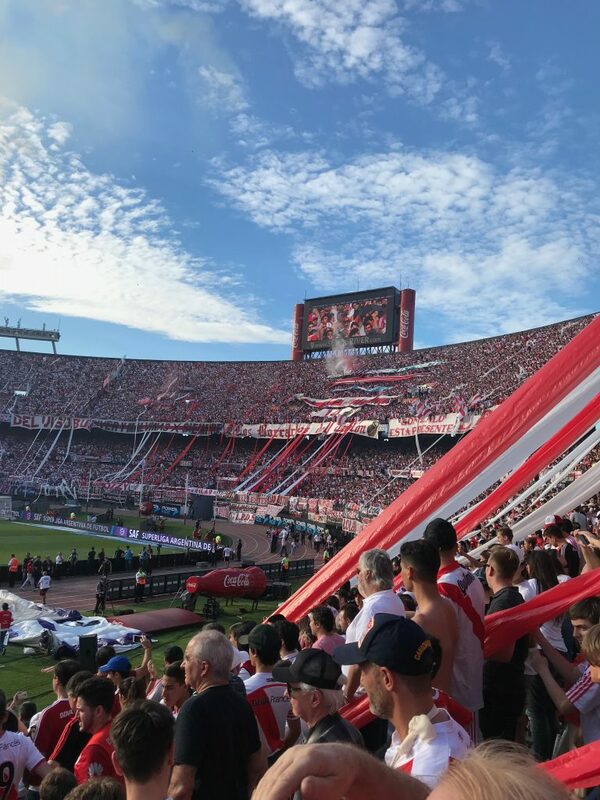 Regardless of all of that nonsense, as a football fan who travels a lot and lustfully chases life experiences – I can hang my hat on the Boca/River derby and say I am 100% happy with my choice and delighted that I experienced this part of Argentinian culture. Would you go to the Superclasico derby between River Plate and Boca Juniors? Thanks for sharing this post, this seems a great match and your experience of it really very nice. Great reading I had. Just to point a little (not that little) mistake, Argentinian clubs have no owners, and this is no exception. The guy there was the current president of the club (Mr Donofrio), clubs hold elections every 5 years to renew the administration. The owners are the members, and they have the right to vote if you have been a member for the past 3 years (this rule applies at least in River, not sure the others but may be not different). Big decisions regarding the club are voted in assembly sessions as well.